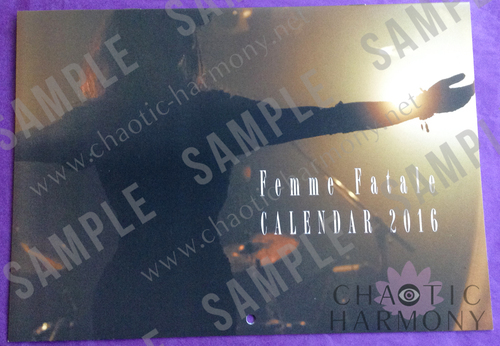 Chaotic Harmony's Femme Fatale 2016 Calendar Giveaway | VKH Press – J-Rock & Visual Kei Coverage Worldwide! Participants MUST complete all 3 steps above to be entered, and those under the age of 18 (or the adult age in your country) must have parental permission. There is one limited entry per person, and the winner will be selected at random. The contest is open to those located worldwide, but everyone should act fast because chances to enter will end on 3/5/2016 at 11:59 p.m. (pacific time). The winner will be notified via Twitter, but if they do not respond within 24 hours, then a new winner will be chosen. WIN A FEMME FATALE 2016 CALENDAR! ABOUT CHAOTIC HARMONY IMPORTS: Chaotic Harmony Imports was created in early 2016 after seeing the high demand for visual kei merchandise that is often sold exclusively in Japan and hard to obtain. Understanding this gap, the 3 founders of Chaotic Harmony came together to use their extensive knowledge, experience, and connections in order to help fans more easily obtain merchandise while still supporting the artists.